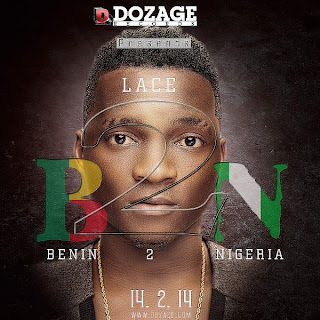 Dozage Records flagship act LACE gets set to drop his debut album Benin to Nigeria on Valentine’s Day. The emerging Nigerian born Beninese hitmaker Taiwo Agbohunsa popularly known as LACE who is highly regarded as the future of trado-contemporary music in Africa by virtue of his perfect blend of urban R & B and Hip-Hop with an infusion of his mother tongue (Egun language) which he does with accustomed ease. Having released a slew of singles like‘Sebiwo’ back in 2010, Lace has been constantly defining a sound of his as well as gathering a cult-following after dropping follow-up singles like ‘Gba Be’ feat Olamide, Fere (Whistle) and his much talked about inspiring single‘Change My Story’. Expected collaborations includes industry heavyweights such as 9ice, Ice Prince, Skales, Yemi Alade to mention a few. Multi-award winning producer, Solomon Oyeniyi (K-Solo) and Fliptyce spearhead the production aspect alongside other fast-rising producers such as Wilmic,Frankie Free and female producer DJ Toxiq . Dozage Records chaired by acclaimed entrepreneur, Seun Dosunmu (Shawn Dozzy) is home to some of Africa’s most exciting music talents; Lace, Mayor Wete, Safin De Coque and the first lady of the label, Enny have all brought their diverse musical backgrounds to the fore and are ready to sink their teeth into the industry in due course. Shawn Dozzy unequivocally believes the record label will soon be “Power House of Music in Africa” with the new breed of talents honing their skills under Dozage Records. ‘Benin to Nigeria’ will be marketed by UBA Pacific as the album release party is set to hold at Terra Kulture, Tiamiyu Savage Street, Victoria Island on the 14th of February by 8.00PM, with a press conference billed for 7th of February at Club Vegas in Ikeja by 10.00AM which shall be anchored by versatile comedian Omobaba 1 and screen diva Labi while Dj Spinall of Beat Fm will man the wheels of steel.